Mrs. ReaderPants: Genre Personality Profiles: The Gang's All Here! Genre Personality Profiles: The Gang's All Here! 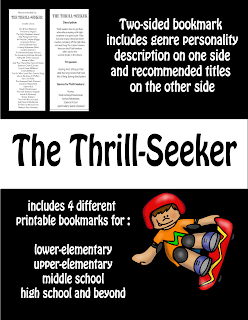 Thank you all for your patience as I finished the Genre Personality bookmarks. After six weeks, I have finally (FINALLY!) finished bookmarks for all eight Genre Personalities! That's 32 bookmarks, y'all! They are linked below, and you can download all of them free from my TPT store. They are also available as a bundle with my What's Your Genre Personality? Quiz, which in addition to the PowerPoint quiz, now also includes a printable version of both the elementary and middle/high school quizzes. If you purchased the Genre Personality Quiz previously, just re-download the bundle from TPT to get the updates. Thank you! I love the descriptions of readers.